Well, it’s officially wedding month and I’m so happy I could cry. I met our coordinator at our venue yesterday to confirm everything for the wedding and it’s so reassuring to know all our plans are coming together how I envisioned. I’ll be sharing more on our coordinator after the wedding but one of my favorite things about having her is I know her style is almost identical (or better than) mine. So, if something goes terribly wrong or needs to be adjusted the day of the wedding I 100% trust her decisions. I know anything she would do would be something I would also do and that takes a thousand pounds off my shoulders. Wedding planning has been one of the craziest experiences for me. I’ll touch more in depth on everything later, but it has been a roller coaster of emotions. There were days when I didn’t know if we would make it and to be only two weeks out seems impossible. It still feels like one of those things that isn’t really happening. 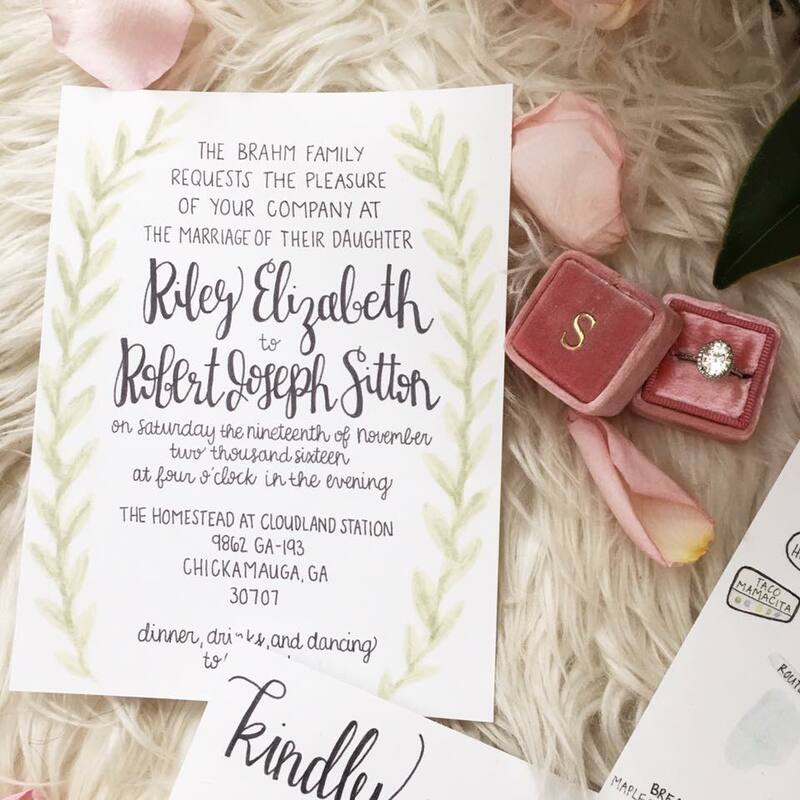 One thing that made everything slightly more real were the invitations. Once they were sent out, you know there’s no turning back.. you’ll actually have guests at your wedding!! Much like anything I do in life, finding invitations was a struggle. I hate, hate, hate making decisions. I’m extremely picky and usually have a vision set in my head. Nine times out of ten, I’m never able to make that vision a reality. –I cannot tell you how many times I’ve envisioned the perfect sweater, shoes, bag or accessory only to never be able to find it anywhere. I’ve actually tried to sew my own clothes by hand multiple times because I’m so persistent on a certain outfit. I’ve been this way since I was a little girl, I used to make clothes out of pillow cases! When I was talking to my good friend Molly, I was telling her I could not find any invitations to fit my vision. I wanted elegant, simple, slightly rustic and hand painted (totally not picky right?!). A few days later she texted me a few sketches and I was so happy I could cry. 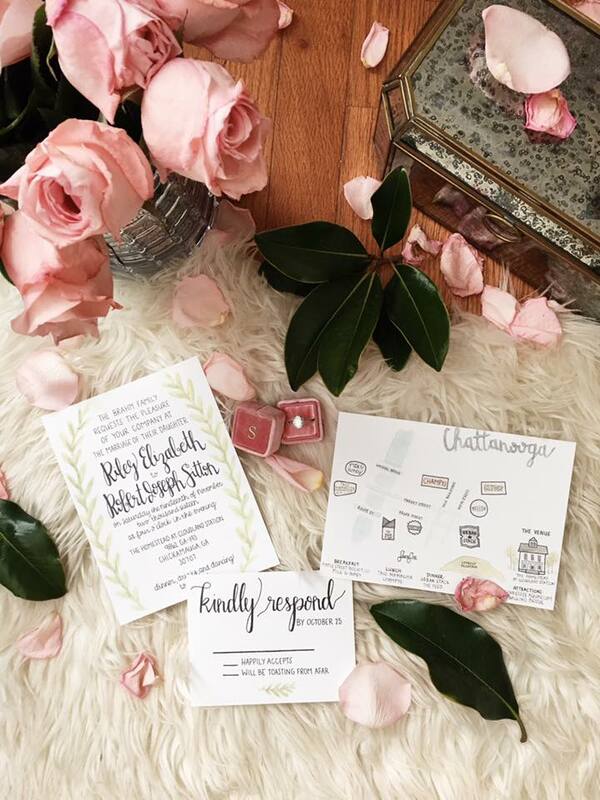 First Molly sent me a sketch of a few sample invites and we combined them to create the perfect wedding invitation. It was everything I envisioned, one of a kind and beautiful. Next we started working on a map of Chattanooga. I have so many family members and friends traveling to Chattanooga for the wedding weekend. I wanted to provide them with a few of our favorite places to check out if they have any free time. 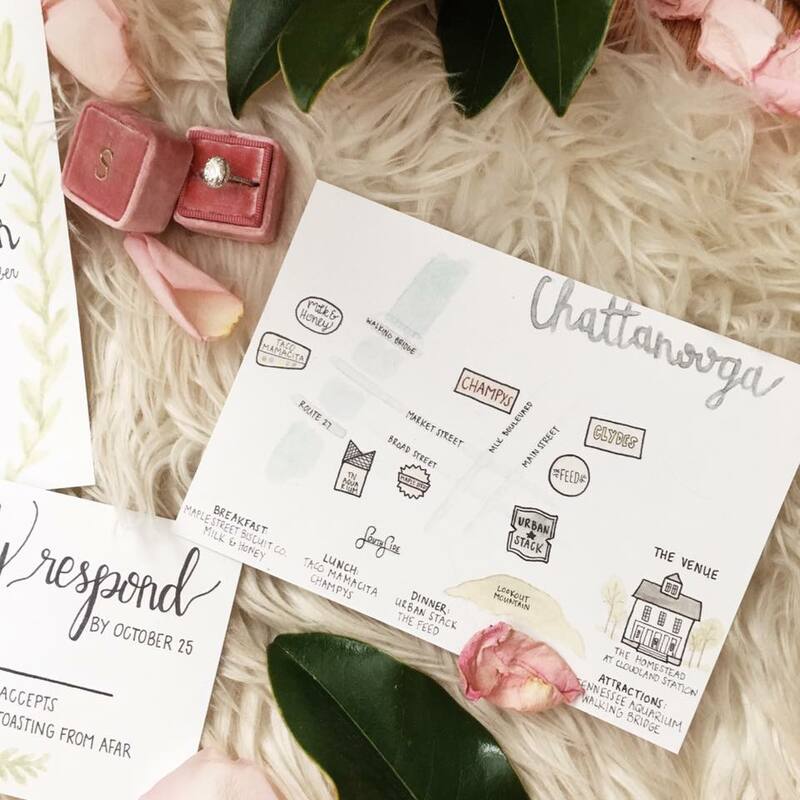 Chattanooga has so many hidden gems but Molly captured our favorite spots so perfectly. I love this card so much because I think it makes the perfect memento for our guests. If they decide to they could leave it up on their fridge or even frame it, like I plan to do. 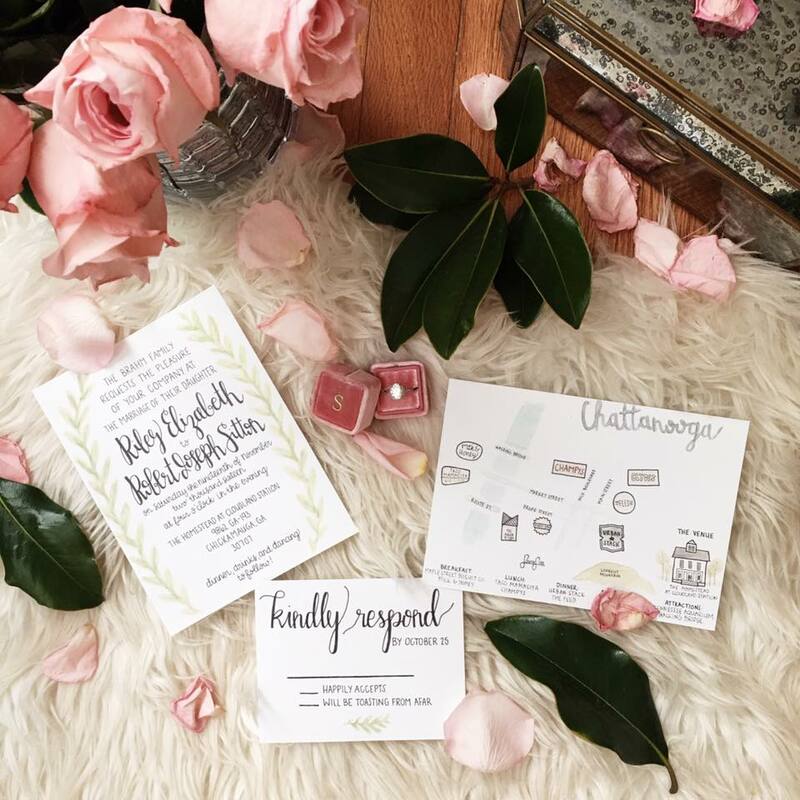 Being a blogger, I’m all about supporting small and local businesses and I’m so happy Molly was able to work with me to make my dreams come true. As an early Christmas gift to you guys, she’s offering 10% off any orders between November 2-16th. All orders placed by the 16th will arrive by Christmas! 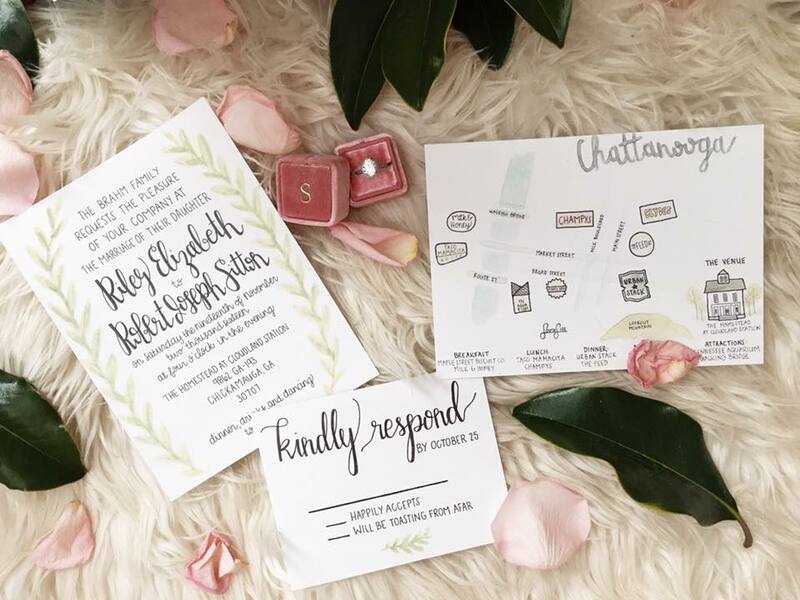 In addition to invitations, Molly can turn any photograph into a hand painted, water color print. 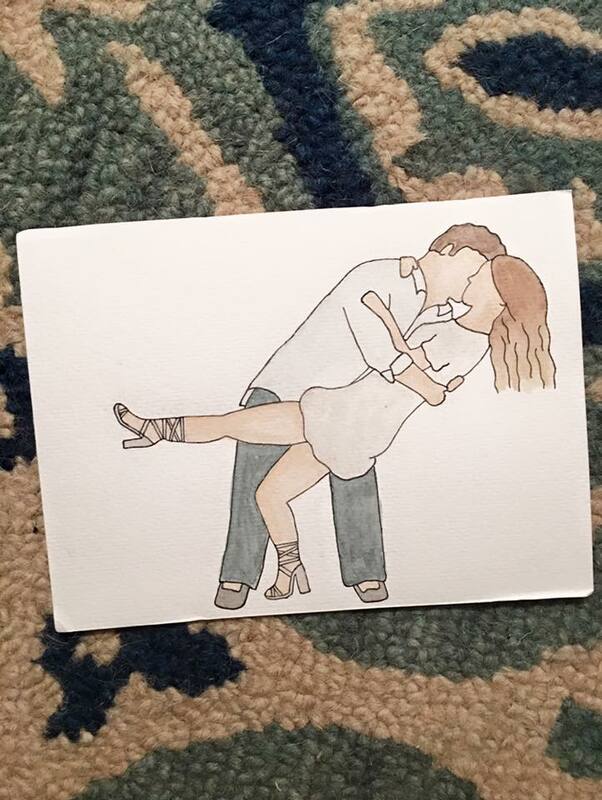 You can see above where she painted one of our favorite engagement pictures for us! To receive the 10%, follow us on Instagram (@YesPleaseDaily + @Molly_GSmith) & mention that you did during checkout. 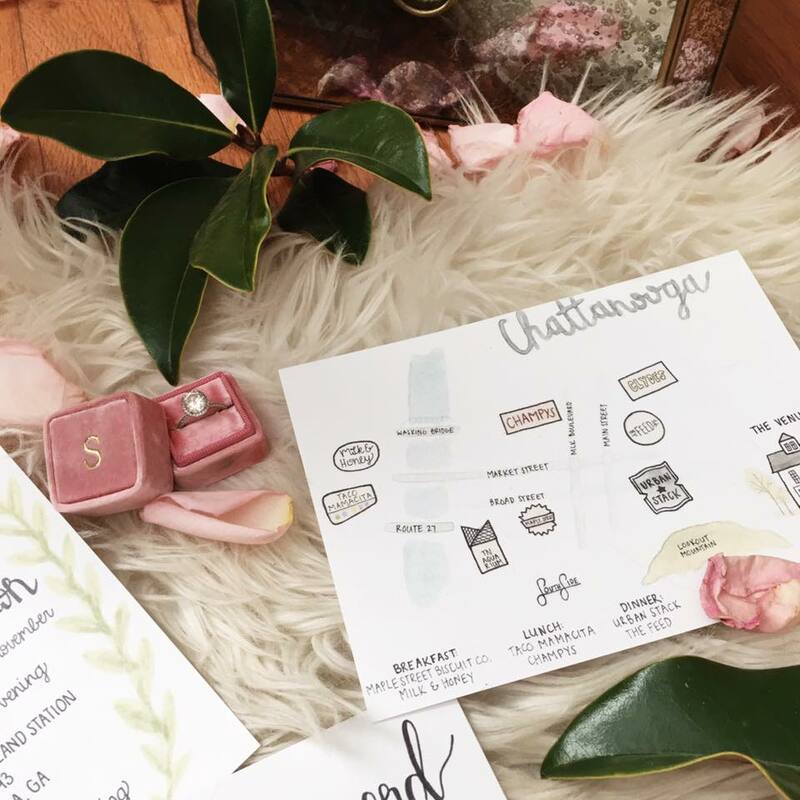 Be sure to check out Molly’s adorable blog, Oh Baby Mama + you’ll find more info on all her amazing work. I can’t believe we’re reaching the end of #WeddingWednesday. I have a few more to share after the honeymoon, but come 2017 I’ll have to find a new series to share with you babes! I would love to hear any ideas you may have. Happy hump day loves!